Hyperlogs | Time Tracking has never been easier! Are you still using spreadsheets to keep track of time? Time Tracking has never been this easy. 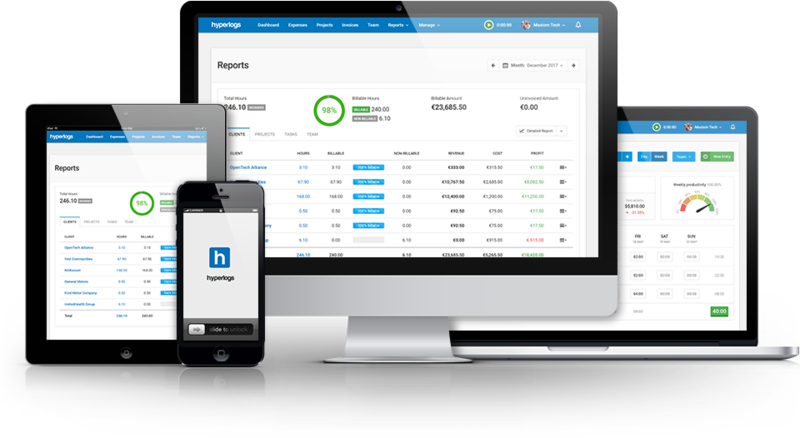 Hyperlogs is the most comprehensive easy-to-use time tracking, expense and invoicing app for all your projects and teams. Put those spreadsheets down! It’s time to focus on growing your business. Research shows that businesses lose a staggering average of 15% to 30% revenue in unlogged time-entries. The same reports show that this is the result of cumbersome and hard to use software, spreadsheet based time tracking and bad internal processes. 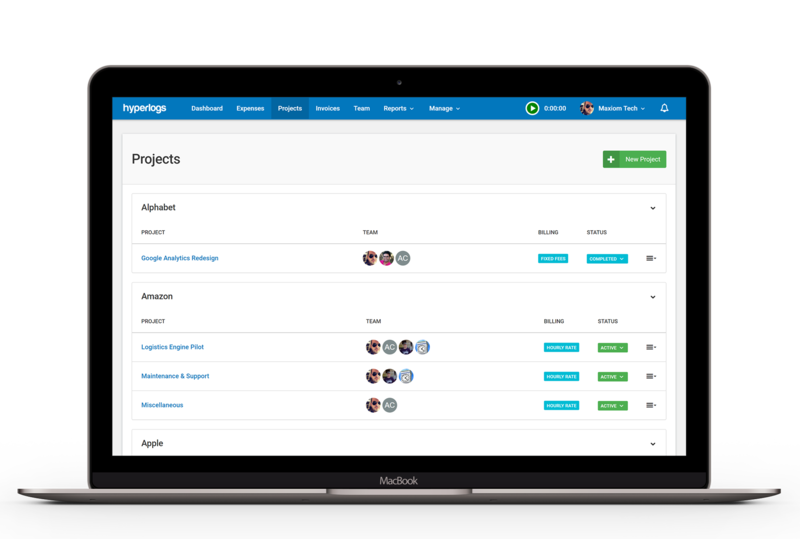 We designed Hyperlogs to eliminate the cumbersome and error-prone task of keeping track of time. Reminders, notifications and alert are all part of Hyperlogs’ intelligent waste and loss prevention mechanism that ensures your business stays on the path of upward mobility. Hyperlogs works with you wherever you are. Fire your app on the go on your iPhone or Android device, or at the office on your Desktop Mac or PC, Google Chrome or FireFox browsers or Slack. 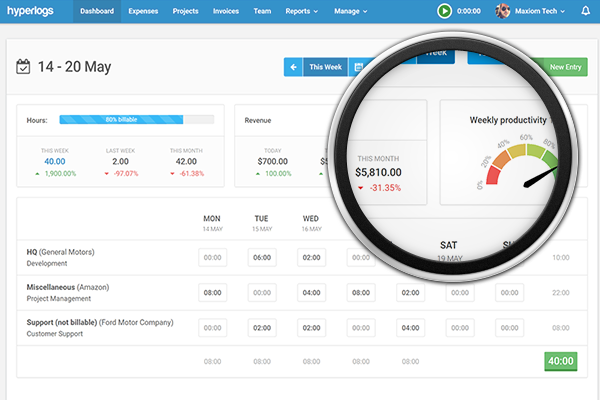 Time and expense tracking simplified. Stop micromanaging and start focusing on running and growing your business. 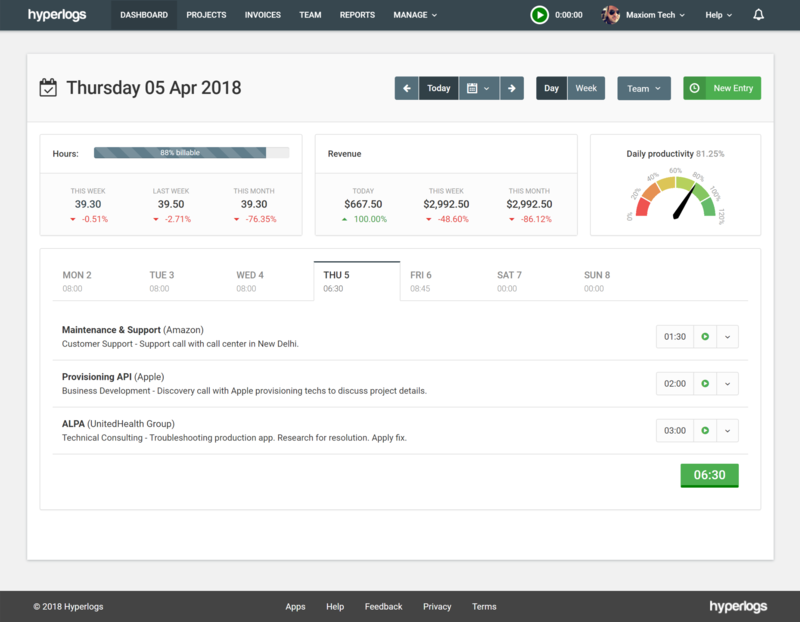 Hyperlogs gathers your projects data and compiles it all into micro-dashboards full of invaluable business and project insights. Less hassle. More productivity. More control. Our customers see an average 12.6% increase in recovered revenue and spend less time micromanaging and manually tracking project resource productivity. Today a client was asking me about where a project went sideways and why I was over hours. 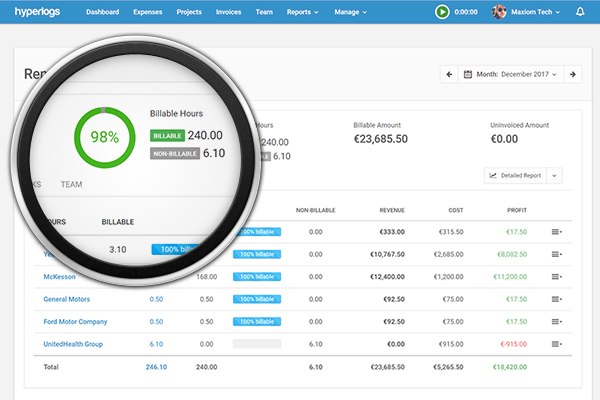 I was able to use your tool to quickly generate a detailed report of every hour billed including meetings. Super happy with how well it has been working 🙂 it is a great tool and I love using it! My favorite feature of this software is the powerful insights which help us seamlessly do the decision making for our business. Knowing the product costs and total revenue helps us enhance our productivity. Another thing which I like most about this software is that the pro plan can be accessed with a small amount per month. This tool makes it really very easy to log hours and isn’t intrusive at all. UI is really nice. It is good product for the price you pay. When I signed into the app, I found it incredibly easy to get started and start logging times and get a good overview of the week. Easy to use and great for planning with teams. Time tracking software is never an easy thing to win, but these guys nailed it. Easy to create clients, log hours and work types per-project. Interface is both easy on the eyes and mostly easy to understand. We believe everyone should have access to our great features and therefore everything is included with no limits whether you are an individual moonlighter or a large multi-national corporation you deserve to have the tools to succeed. Nonprofits and educational institutions receive special discounts and incentives. We also offer discounts for 50+ person teams. Contact us at sales@hyperlogs.com to inquire. Yes, we issue pro-rated refunds, however we ask that you please try our free plan for a while to make sure Hyperlogs is right for you and your team. We accept all major credit cards including Visa, Amex and Mastercard.